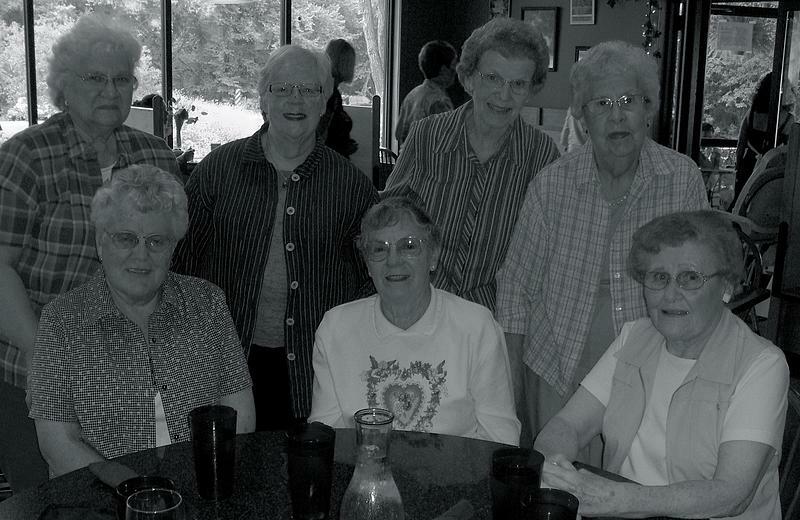 The Peony Club is an informally organized group of women, most of whom are retired from service in Preus Library. The group, which currently has nine members, was formed in the late 1970s or early 1980s when staff retirements began after the move into the new Preus Library, fall 1969. Strong friendships had formed and there was a desire to gather together regularly to keep in touch and update the retirees. There are two memories about the origin of the group’s name. Ruth Remmen (Cataloging) suggested it after looking out the south window beside her desk and noted the beautiful bed of peonies blossoming there. The many varieties of peonies there had been provided by nursery owner Frederick Wolhowe, ’28, who also had donated a significant sheet music collection to the College. The other explanation is that the word peon-ies was a humorous depiction of the women’s status. In recent years, The Peonies have been meeting monthly at area restaurants for lunch or dinner, depending on the season of the year. The first item of ‘business’ at these gatherings is the status and well-being of members, spouses, children, and grandchildren. News of recent or future travels and celebratory events, as well as Library and Decorah news, is shared; and the place and date of the next meeting is determined. Currently, Jean Dickman and Betty Drew are the conveners of The Peonies. At a recent summer evening meeting, the members reminisced about the move from Koren Library and the past forty years of Preus Library. Jean Dickman recalled that moving into Preus meant going from manual typewriters to electric! Irene Johnson recalled that she and Hattie Lillegraven didn’t like cleaning the cork floors in the Koren restrooms; they were looking forward to the marble and tile in Preus Library. In addition, the service elevator in Koren was very undependable. There was an intense, lengthy, late-night ‘all hands on deck’ cleaning session to prepare Preus Library for its dedication ceremony, Sunday, May 11, 1969. Jean and the others stressed that food and dining out always have been important parts of Preus Library life and camaraderie. Summertime luncheons in homes, potlucks in the Staff Lounge, and Christmas parties at a variety of locations (the first one in Preus’ basement) were frequent. Recipes for coffee break and potluck goodies were reproduced on blank catalog cards; in 2001, many of the recipes were compiled to create the cookbook, Taste of Preus Library. ‘Working’ lunches in downtown Decorah and at area churches were common. Shopping and dining trips to La Crosse, Rochester, and Cedar Rapids in a College van were aided and abetted by the head librarian! Taste of Preus Library. Recipes compiled and edited by Cynthia Jacobson and Andi Beckendorf; Humor compiled by Eddy Atwell. Decorah, IA, Luther College Press, 2001. Library maintained by Ryan Gjerde. Page last updated on 9 January 2018.